Why is flossing your teeth important? What is the correct way to floss my teeth? How long should flossing my teeth take? Are floss-picks as effective as regular dental floss? Is it a bad sign if my gums bleed during flossing? Only flossing can thoroughly clean the surfaces in-between your teeth. Flossing your teeth is crucial to the long-term health of your teeth and gums. Only flossing can thoroughly clean the surfaces in-between your teeth. Brushing alone cannot access these areas and leaves food particles in-between your teeth. If you’re not flossing your teeth, you’re not removing food particles from in-between your teeth. This leads to cavity formation known as interproximal cavities as well as gum disease. It turns out that flossing your teeth is just as important as brushing. Flossing your teeth the right way can be quite challenging. In fact, most people do not floss their teeth the correct way. First, grab a long enough piece of dental floss. 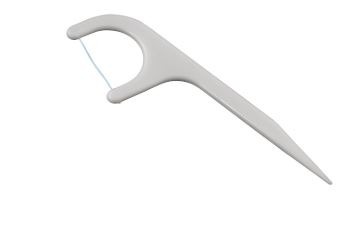 Ideally, you need about a 12 to 18 inch long piece of dental floss. Roll the floss firmly around your two index fingers, making sure to get a tight grip. Pass the dental floss carefully through each gap in-between your teeth. As you go in, carefully wiggle the floss left and right against adjacent teeth surfaces. Your objective is to remove the plaque which has gathered in-between the teeth surfaces. 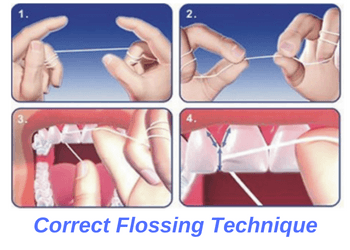 Once done, re-position the floss to clean the next tooth surface. Continue until all teeth surfaces in-between your teeth have been properly cleaned. Don’t rush flossing your teeth. Correctly flossing your teeth takes a few minutes. Only floss one gap at a time. Avoid flossing two gaps at once as it is ineffective and won’t clean your teeth properly. Spend a few seconds flossing each gap before moving on to the next one. Pay attention to floss the areas behind your furthest positioned teeth. Avoid rushing through the process or you could end up leaving harmful plaque behind. Floss-picks should not be a substitute for your daily flossing routine. Floss-picks are not nearly as effective as traditional dental floss. Essentially, using a hand held floss-pick should not be a substitute for your daily flossing routine. However, floss-picks are an acceptable supplement to your daily hygiene routine, especially when using a dental floss can be inconvenient. For example, you can use floss-picks at work, on lunch breaks or when out and about. The only exception is for those who are incapable of using regular dental floss due to some sort of disability. This includes those suffering from chronic arthritis pain, carpel tunnel syndrome or other manual dexterity challenges. In these cases, you can solely use a floss-pick to clean your teeth in place of string dental floss. Bleeding gums are typically a sign of gum disease. You should see your dentist for an exam and dental cleaning to address your bleeding gums right away. However, if your gums continue to bleed after the dental cleaning, then you may have to give it some more time. 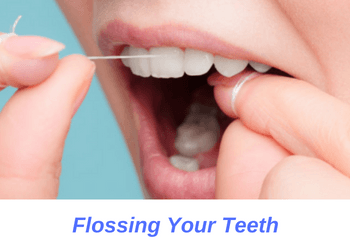 Continue flossing your teeth daily using correct flossing technique. Gradually, your gum bleeding will slow down and eventually stop. If your bleeding goes away within a few weeks, this is a sign that your gums have healed. On the other hand, if the bleeding keeps persisting or becomes worse, then you should follow-up with your dentist.